The most advanced and precise multi-function light meter for Cine or Video, plus exposure calibration for still imaging. The Sekonic L-758Cine Digital Master is the ultimate light-measuring tool for cinematographers, videographers as well as digital still shooters. Offering the most extensive range of fps (frames-per-second), cine shutter speeds, and shutter angle settings, it meets and excededs the demands of Professional Cinematographers as well as Professional Still Photographers. It is the first to offer a 1A' parallax-free spot viewfinder with a digital display. A built-in retractable incident Lumisphere for standard or cosine corrected light readings, provides both hemispherical and narrow angle readings. The L-758Cine Digital Master will handle any lighting situation. It offers foot-candle, lux, foot-lambert and cd/m² measuring modes plus cine shutter speeds from 1 to 1000 fps and shutter angle settings from 1° to 270°. The L-758Cine Digital Master features a rectangular 1° parallax-free spot viewfinder. In dim or bright light situations, the L-758Cine Digital Master's spot viewfinder displays shutter speeds, aperture and more. 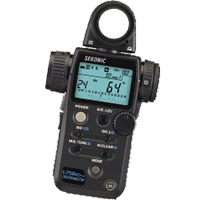 The built-in spot meter measures both reflected ambient, flash or combined lighting. The optical finder also features an eyepiece with an adjustable diopter. 1° to 10° in 1° increments, from 15° to 270° in 5° increments plus 12°, 17°, 22°, 144° and 172° individual settings. 1 through 1000 fps (frames per second). f/0.5 to f/45 (in 1/3 steps). Selectable on ISO 2: 85, -n3, -n6, -n9, -A3, -A6, -A9 or +/- 5.0EV in 1/10 step increments for Incident and Reflected independantly. Electronic flash units and/or cameras can be triggered and measuring of flash units up to 100 feet away is possible. With its new easy-to-use Selective Quad-Triggering control (4 zone lighting control), the L-758Cine Digital Master offers quick selection of which flash unit to trigger and measure independently with a touch of a key. Now you can individually measure several flash units wirelessly by the touch of the meter's measuring button, without walking over to each light and turning it on or off. Up to nine readings can be memorized and displayed on the analog scale independently in incident or spot metering modes in both Aperture and Shutter Priority Modes. Using Memory recall and clear, you may review all memorized readings individually on main display and selectively delete individual readings, or clear all simultaneously. Both shutter speeds and apertures can be displayed in either full, 1/2 or 1/3-step increments plus 1/10 stop units to match your film or digital camera; selecting these increments is quick and easy with custom software menu settings. Independent incident and reflected exposure compensation. Type: Dual readout digital light meter for ambient and flash, incident light and reflected light.